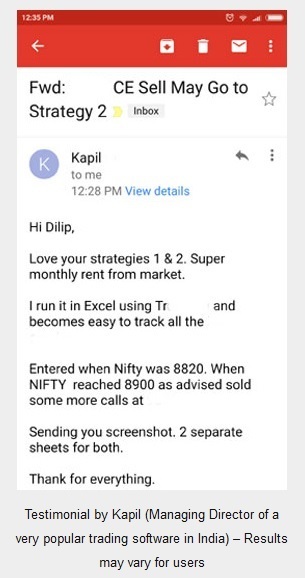 Have you ever done a course and got so much confidence that you are ask your mentor on how to deploy a capital of 8 lakhs with the strategies learned? 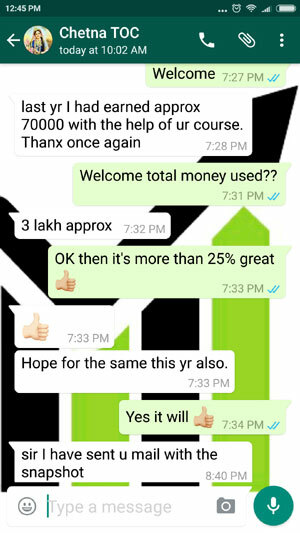 How do you feel when you do a course worth a 5 or 6k and think about deploying 8 lakhs after see that these strategies work and can be compounded to make money month after month for your entire life? Hope you are doing well. Attached file contains the strategies I bought from you so far. 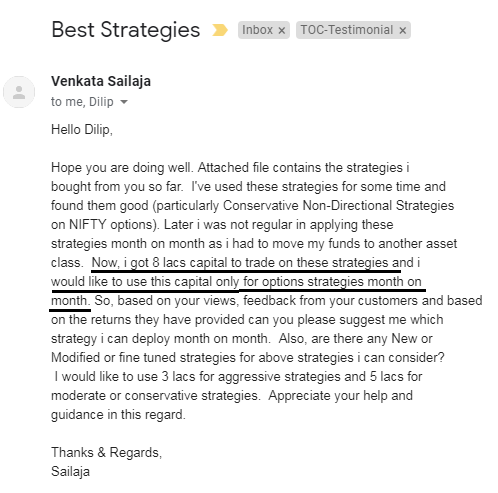 I’ve used these strategies for some time and found them good (particularly Conservative Non-Directional Strategies on NIFTY options). 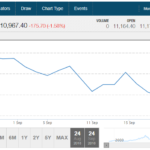 Later I was not regular in applying these strategies month on month as I had to move my funds to another asset class. 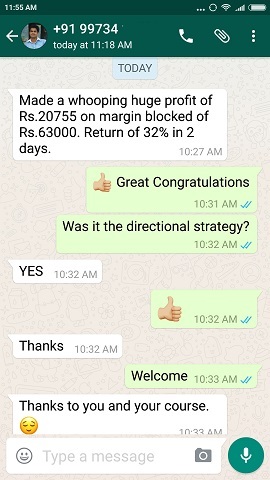 Now, I got 8 lacs capital to trade on these strategies and I would like to use this capital only for options strategies month on month. 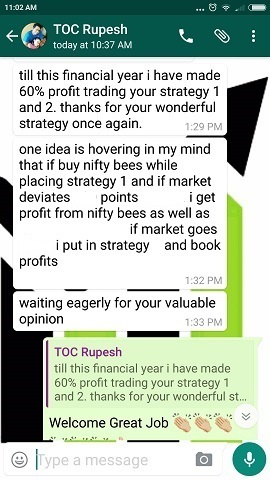 So, based on your views, feedback from your customers and based on the returns they have provided can you please suggest me which strategy I can deploy month on month. Also, are there any New or Modified or fine tuned strategies for above strategies I can consider? I would like to use 3 lacs for aggressive strategies and 5 lacs for moderate or conservative strategies. Appreciate your help and guidance in this regard. 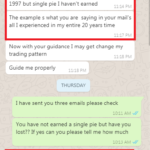 Nice to know you have made good profits from my strategies and taking the second step to success – trading with more lots. 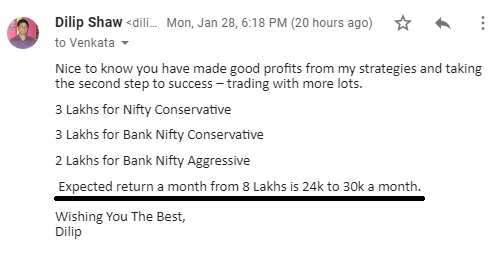 Expected return a month from 8 Lakhs is 24k to 30k a month. Please see above how I have deployed the capital, giving more importance to the conservative strategies and less to the aggressive. Note that aggressive strategies in the bank nifty course has high reward to risk ratio. Conservative ones have low risk and low reward. So why I gave more importance to the conservative strategies? Because when more capital is at stake its better to first look at safety than the returns. 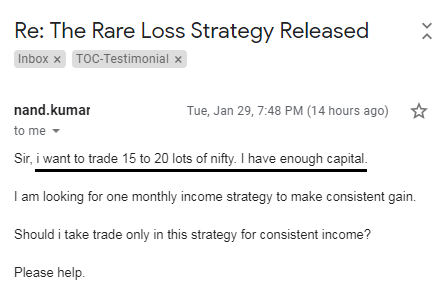 There is another point you should note that I have divided the money into three strategies and not asked him to trade only one strategy. The reason is financial management – Don’t Put All your Eggs in One Basket. I am sure you must have heard this phrase many times in your life or read it many times – but the question is DO YOU FOLLOW it? If no you just got another reason why you are losing money in stock markets. This is what happens – you win in one trade and double your stake in next. If you win again you triple your capital. But this time you lose. Now to take revenge you take another trade with four times the capital. Even if you succeed one one revenge trading it will not bring back all the money you lost. This can bring in mental issues. This is the reason I emphasis on hedging all your trades so that even if you lose money it will be small amount that will not bother you much. Its really frustrating to bounce back from bad trading but its not impossible. Now some words on risk management and why its important. Well financial risk management is not only limited to trading but to whatever you earn in life from your job or business. I follow the 25-25-25-25 rule that you may check here – now to follow it or not is your choice but at least make a rule that is comfortable for your lifestyle and earnings vis-a-vis your expenditure and savings. By high net worth I mean at least 7 Lakh and above. Yes some people trade with 10 Lakhs or more but I feel anything above 7 lakh comes under above average trading account. 1. Never enter a trade without any plan. You have high risk at stake – you should not trade just to trade because you have a lot of money. You should know why you are taking a trade. 2. Do not trade with all the money in any one trade. Limit it to 25% of your entire money. Now even if you lose 10% of this money you lose just 2.5% of your trading account. This is manageable and you will be able to stay in the game for long. I have nothing more to say on this – its explained well above. One loss in a single trade will bring your account back by a big percentage. 3. Depending on the trade set up you may increase or decrease the risk. Here is some explanation. For example if its an Intraday trade you may increase the risk if you see that you are good at it after some practice. But if you are taking an entirely new Intraday trade with different set ups – then reduce the risk unless you get comfortable in the new set up. Do not forget to put the target and stop loss in the system. 4. Depending on the trade set up you may increase or decrease the risk. Hedge your positional trades. Naked trading without hedge that too positional derivative trading is equal to financial destruction. No matter how good trader you are – you cannot do anything with the gap up and down the next day. Its only the hedging – a proper hedging that will save you from huge losses. 5. Never do revenge trading – its a pitfall from where you will never recover. Trader with a lot of money have a lot of ego too. Once they make a loss they bring more money to the table to take revenge on markets and make more. Well they lose more. Revenge trading a never ending loophole of losses. Its better to take small profits consistently on small capital rather than try to make a big home run of profits. HNI traders or traders with large capital have more responsibility than traders with small accounts. One mistake can cost them a life time of pain. So if you are a trader with huge capital you must ensure you are trading with your brains not your heart. Speculative trading, trading without hedge, trading on tips, and trading without planning is a big no no.